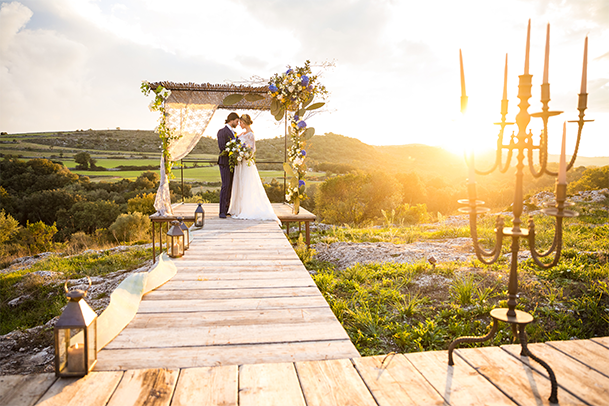 Steeped in tradition and history, nestled in the winding hills of Sicily, lies a dream landscape to exceed anyone’s wedding dreams. A hidden gem to many but a place of luxury for those in the know. 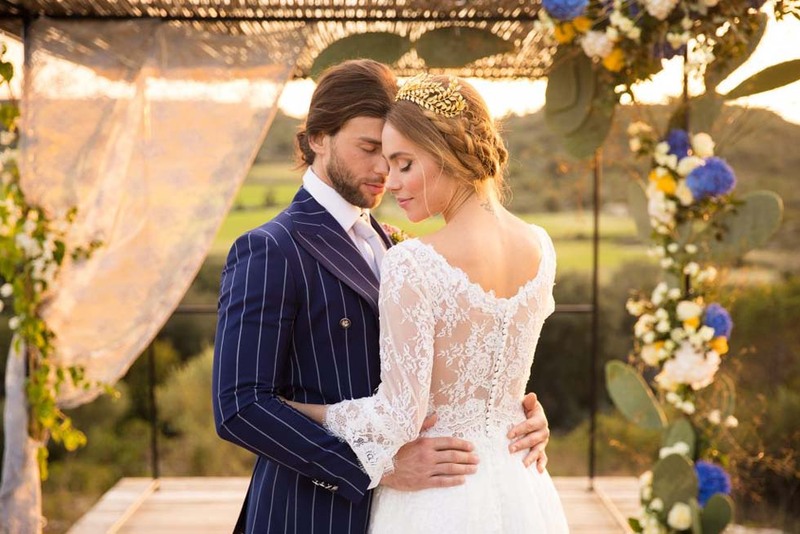 Sicily will soon be known as the new “it” place to be, just ask Chiara Ferragni, one of the world’s most powerful fashion influencers, who, while planning her upcoming nuptials to rapper, Fedez, chose Noto, Sicily as the perfect location. 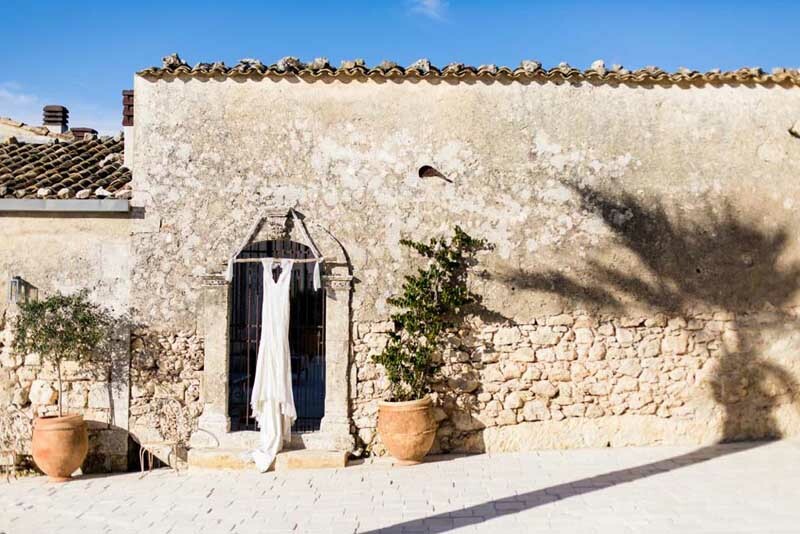 Sicily is a brilliant mix of old and new. Traditional and unexpected. A cultural wonderland with inspiration stemming from Greek, Roman, Byzantine, Norman, Saracens and Spanish heritages. 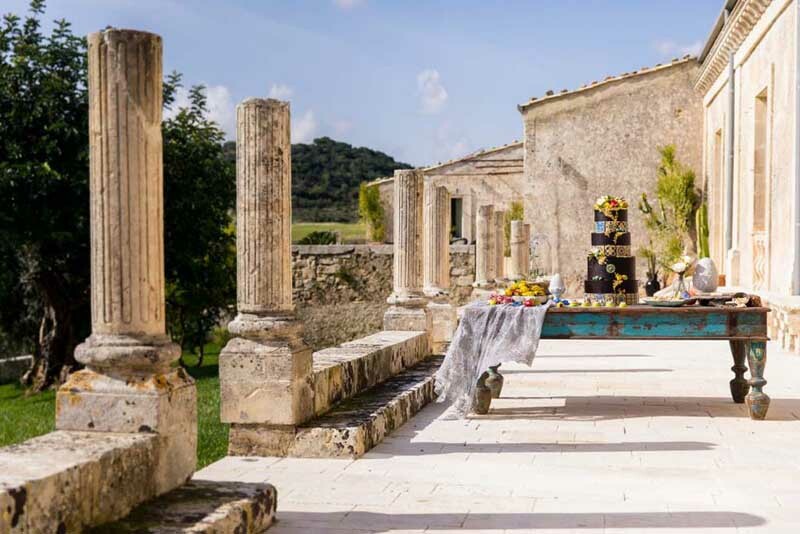 In an effort to showcase the understated elegance and vibrant colors of this wonderful landscape as the perfect setting for a once-in-a-lifetime event, the utmost care was taken in selecting a venue. The only choice for the concept we were looking for was the stunning Dimora delle Balze. This 19th century estate was brought back to life less than a decade ago, by Elena Lops and a team of designers, restoring it to its original splendor with some modern twists. 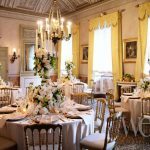 With the ability to host intimate events in a private setting, Dimora was the perfect decision. 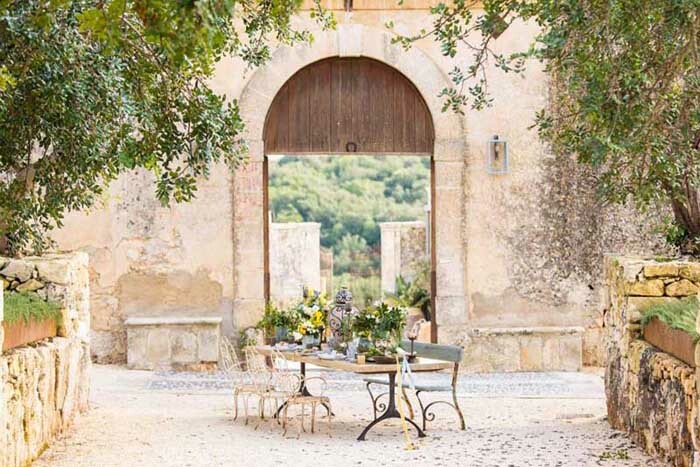 With a desire to show the world the magical wedding destination Sicily is poised to be, Andrea Naar Alba, the highly sought-after event designer and owner of Italian Weddings and Events, put together a group of the finest professionals, top quality products and the best raw materials offered in the area. 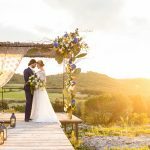 In addition to a romantic location, there was no better fit to create a moving piece of poetry, other than the incomparable Dario Benvenuti Florals. 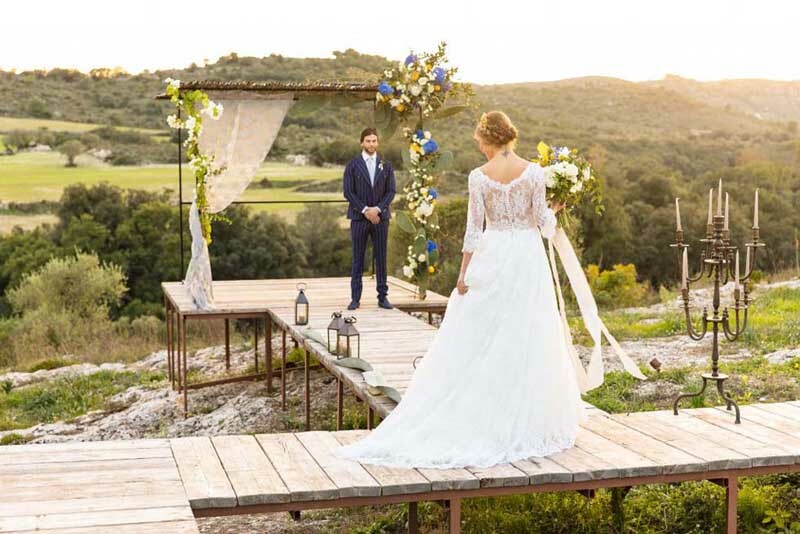 Dario and his team skillfully paired vibrant colors and soft fabrics to blend into the rustic landscape furthering the soulful vision of the day and the stunning vista surrounding us. The final design evoked a feeling that you were immersed in a beautiful piece of art. 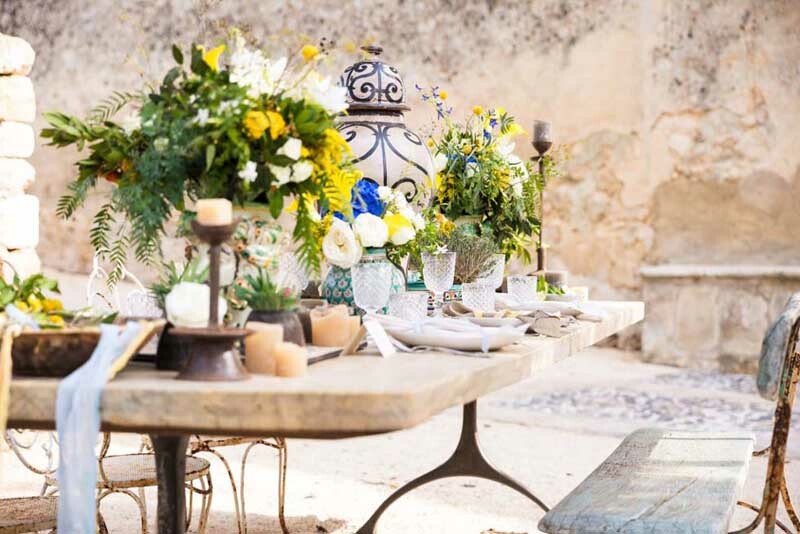 The team pulled the royal blue and sunshine yellow hues, the colors one thinks of when Sicily is mentioned, and pulled them into all aspects of the ceremony setting, dining table and personal florals. 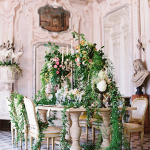 Partnering with Parfum Flower Company and Italian Weddings and Events, a gorgeous feasting table was designed. The same floral palate from the ceremony location and bridal bouquet were utilized as well as candles of varying heights, pottery and cultural aspects, creating a multidimentional tablescape. Knowing that telling a story with your art is extremely important, Dario and the team wove in the Legend of the Moor into his vision. 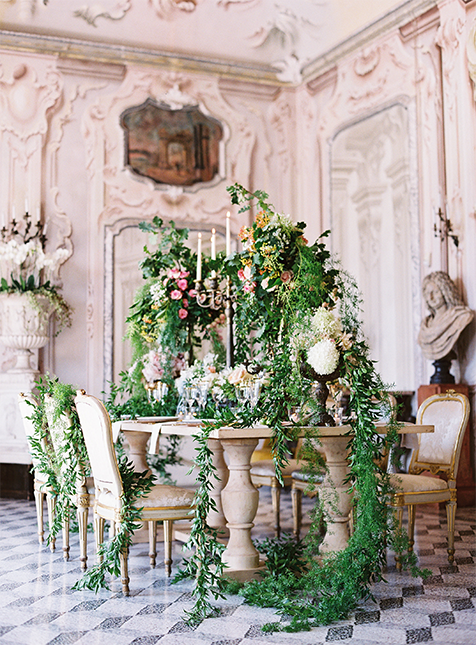 All of these touches helped to create the fairytale that can only be found in Sicily. One of the most decadent and unique aspects of this shoot were the masterful pastry designs showcased by Marco Failla with Bakery Boutique. Marco and his team labored for hours to bring this amazing dessert tablescape to life. Tying in the colorful mosaics that Sicily is known for, they hand painted every detail on both the wedding cake and the handcrafted chocolate. In addition to the world class hand-painted chocolate and delectable pastry offerings from Bakery Boutique, they also specialize in Martorana Fruit. 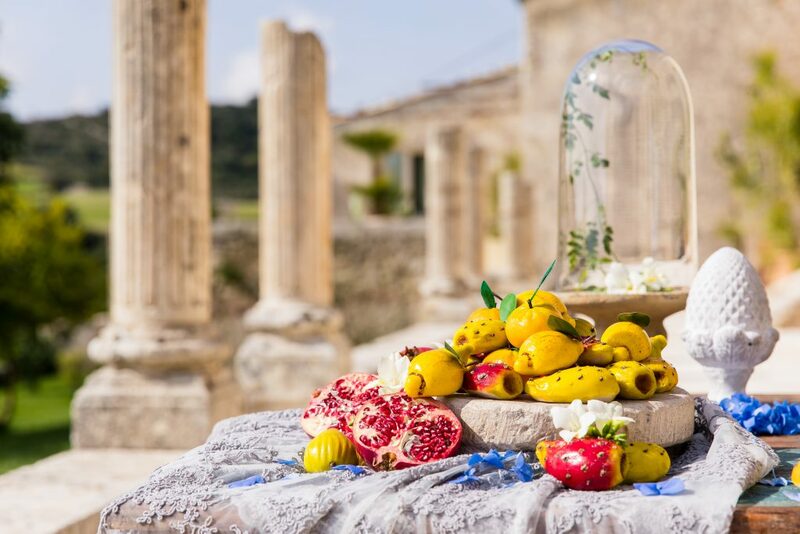 Known in Sicily as frutta di Martorana, these life-like fruits appear real but are made of marzipan. The main ingredient in these sweets is the “pasta di mandorle” or almond pasty. They take their name from the aristocratic woman, Eloisa Martorana, who has a Benedictine Monastery built near the end of the 12th Century. The church is known as Martorana. Another Sicilian specialty to tie into any great event is the Sicilian Granita. Granita is a semi-frozen dessert, similar to sorbet which can be flavored with an endless variety of fruits, flowers, nuts or espresso, sometimes served with whipped cream. The team on this shoot can also attest that it is also fantastic served with your favorite Sicilian liquor. Traditionally it is eaten with the brioscia siciliana, a local pastry which we know as a common croissant. 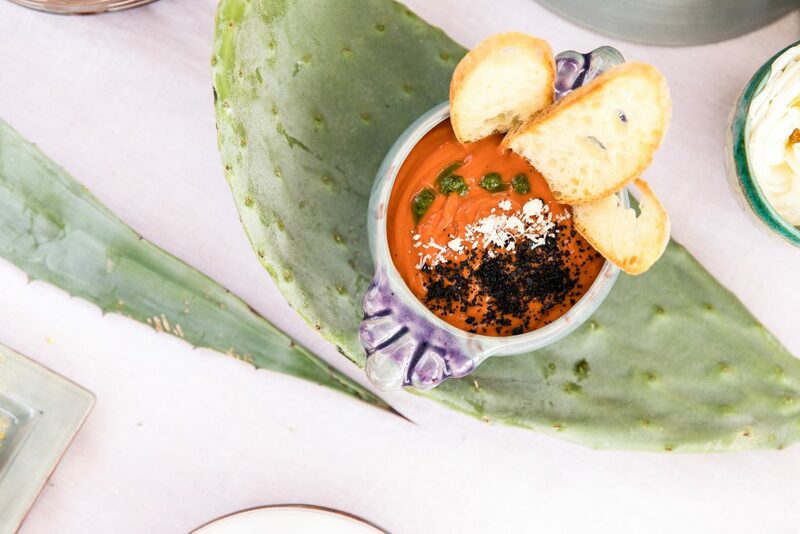 In keeping with tying local food offerings into your event, a great parting treat for your guests can be small containers filled with the couples favorites. Seen here is a unique design by Italian Weddings and Events utilizing chocolate from Modica, Pistachios from Bronte and Almonds from Noto. No event would be complete without amazing cuisine and if you are wanting to have the best authentic Sicilian dining experience you need look no further than Graziano Catering. They say you eat first with your eyes. If this is true than these stunning photos should make you hungry. Beautifully displayed and helping to further accentuate the decor, any foodie excited to be a part of this event. Most importantly the offerings tasted even better than they looked, ask anyone on the team and we can tell you we could not wait until we were done with the shoot for the day just so we could eat. Graziano Catering can custom create menus for any event, large or small and their epicurean delights are sure to please any crowd. 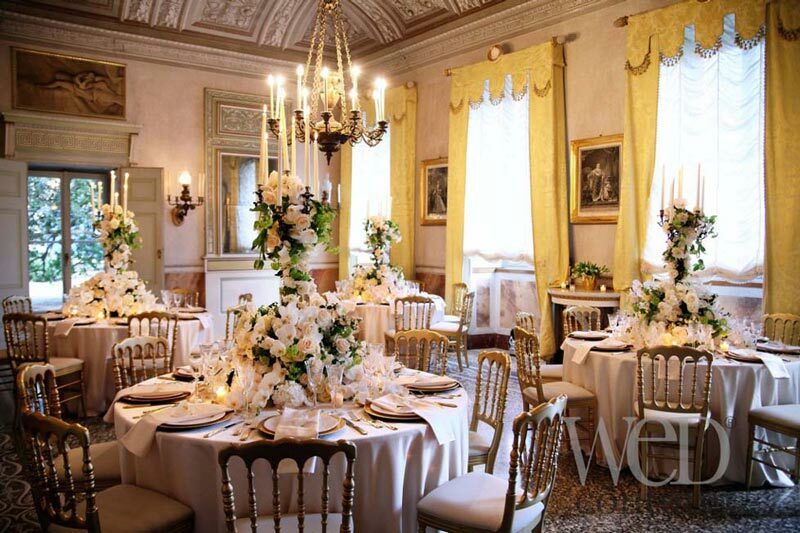 Extra special touches and small details are essential to bringing any event to life. 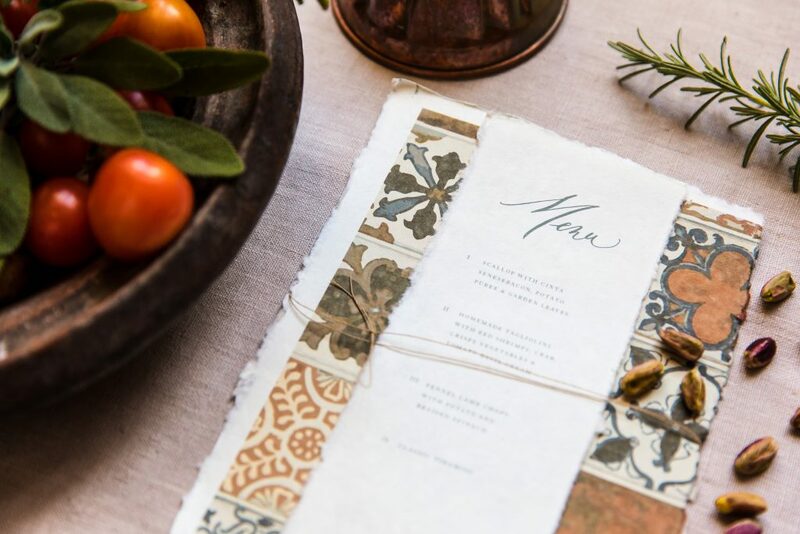 Veronica Halim’s luxurious custom designed stationary should be a requirement for any special event. 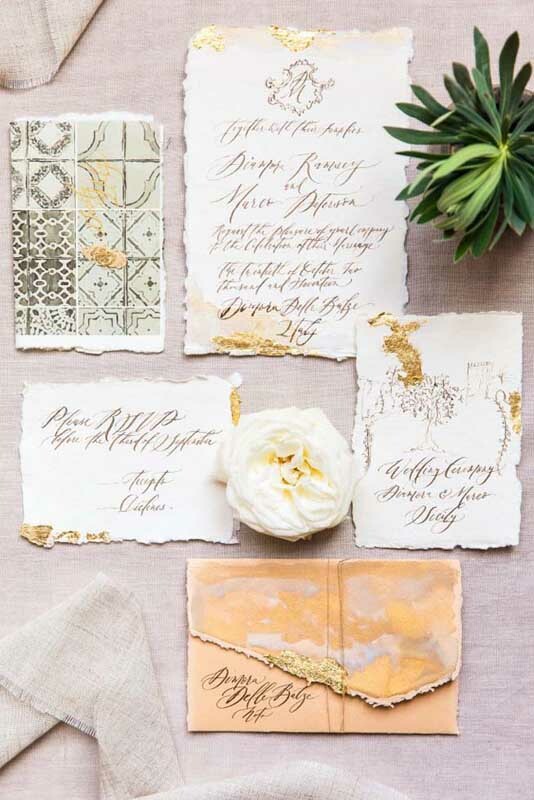 The natural feel and various textures of the parchment along with the gold calligraphy are an easy fit into the heavenly designs of Dario Benvenuti while pulling the rustic details of Sicily through. 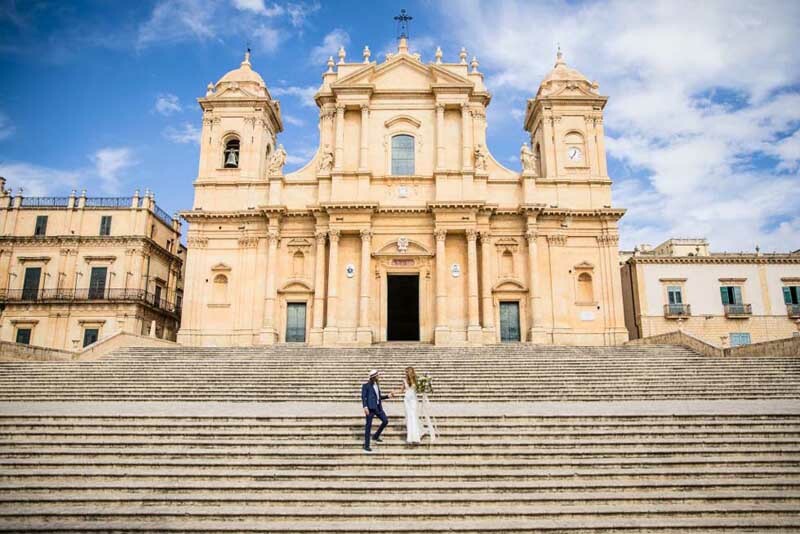 Noto, a short drive from the phenominal Dimora della Balze, is a picturesque setting in which to share your love with family and friends. 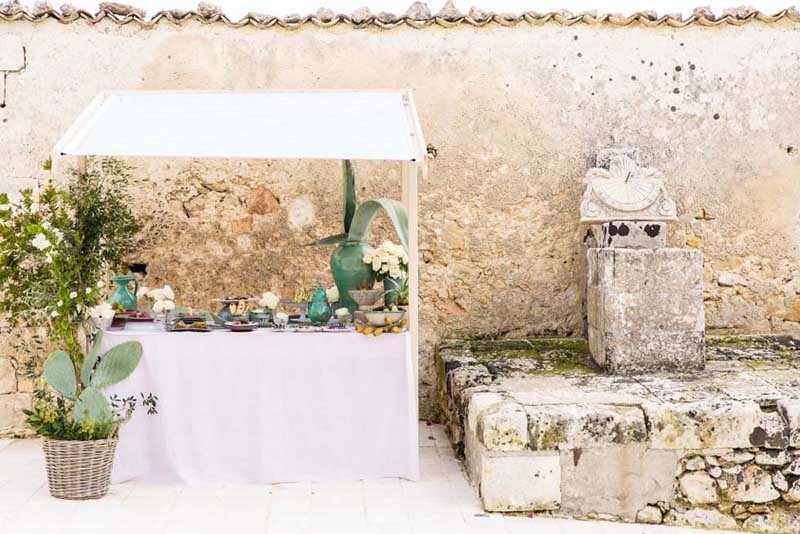 Nestled in the foot of the Iblean Mountains, in the Provence of Siracusa, it’s unique history is prevalent. 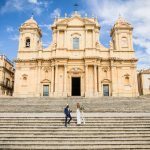 The only thing more impressive than the 18th century Baroque style Noto Cathedral are the welcoming inhabitants of the Comune. Everywhere we turned we were greeted with a heartfelt “Auguri!” Everyone from small children to Sicilian Nonnas stopped to watch the magic we were trying to create on the stairs of the Cathedral. A special thank you needs to be said to the City Officials who gave the team unprecedented access that most would not have. A fairytale can not be complete without a Princess…and her Prince Charming. 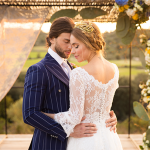 Our stunning bride, due to the expertly crafted looks, seems to have just stepped out of the movie, “Princess Bride.” The gowns from Eugenia Enciu and Pnina Tornai generously loaned by Kleinfeld Bridal and jewelry from Mori e Pupi, look as if they were tailor made to fit her. The top-notch hair and makeup teams, Orazio Tomarchio of La Truccheria Cherie and Salvo Peluso for Toni Pellegrino made her transformations from an etherial bride ready to walk down the aisle to sultry goddess ready to be the star of her own afterparty seem effortless. 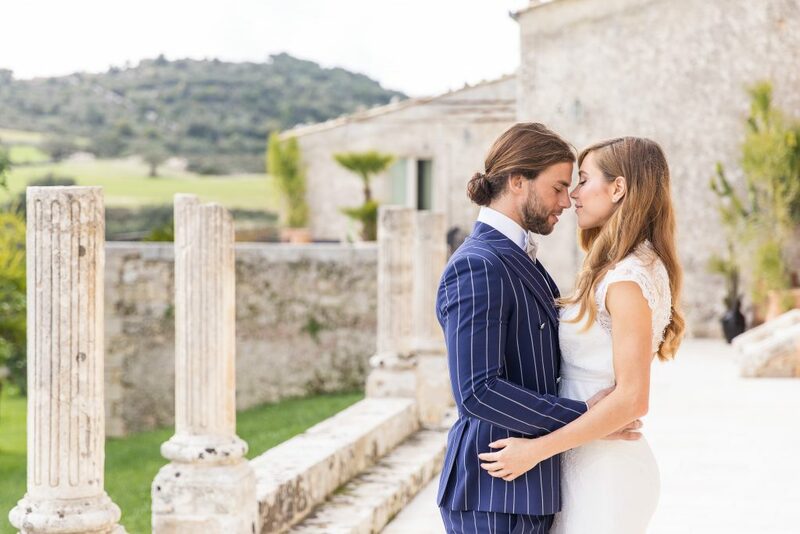 From the soft and subtle makeup and waves of her hair to the statement braid and deep lipstick hues, the team was able to make her the dream vision of a modern Sicilian Bride. 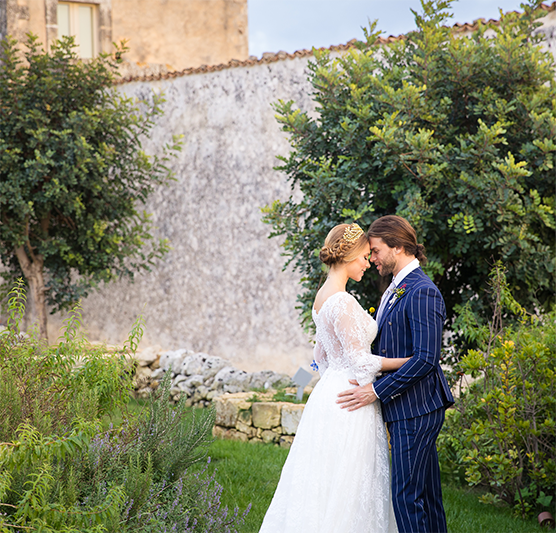 Our groom was able to star with his real-life love in this smart suit from Scribano 1966. 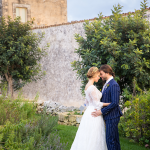 The story and emotions of the day could never have been brought to life without the photographic talent of Brian Leahy Photography and artistic vision of Varna Studios Photo and Cinema. No detail was too small for either of these gentleman. Brian was able to capture the essence of the day with each and every shot, finding angles that made each photo come to life. 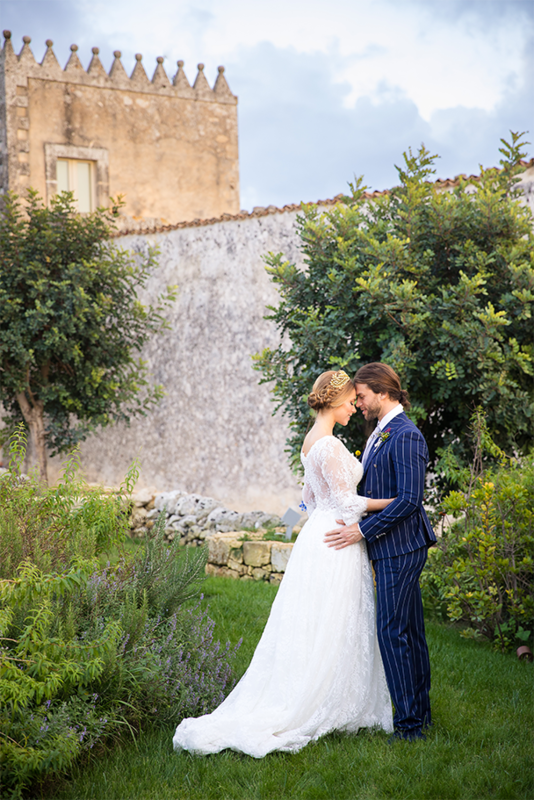 A premier photographer, in demand the world over, Brian was the first choice to join in Sicily. His fun and laid back nature made this shoot feel effortless yet the photos he produced carry an air of sophistication. Brian was completely on board with showcasing the landscape and culture of Sicily when most suggested elsewhere. New and fresh was what this shoot needed and Brian provided it. Aurelijus with Varna Studios was able to put together two pieces of cinematography, one to showcase the professional shoot and one to showcase the love this team has for one another, both creating goosebumps for everyone that is lucky enough to watch. The sign of a fantastic piece of cinema is one that pulls emotions from your soul…can make you laugh and make you cry and Varna Studios does this without even trying. The team would like to give a huge thank you to the Styling and Editorial Team at The Knot for believing in our vision of Sicily that we felt the world, and future brides, needed to see. To read more please go to www.theknot.com/ to see more photos and some fun behind-the-scenes footage of our adventures.